The first teaser images of the new Audi Q8 SUV have been released. 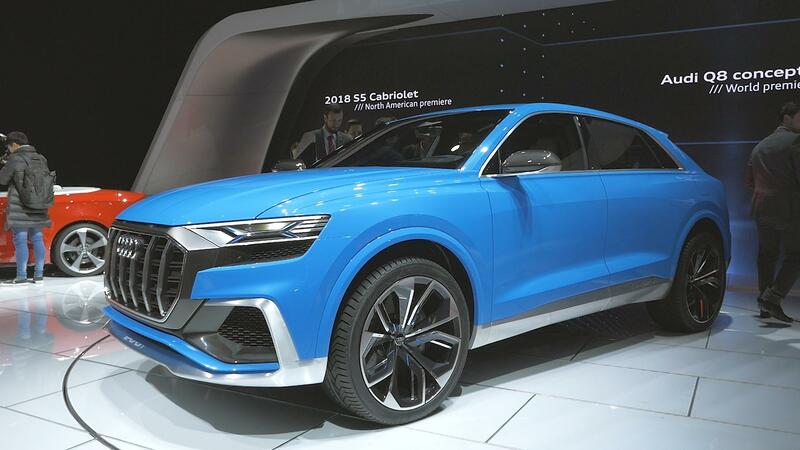 Expected to be launched this summer and positioned just above the Q7, it will be based on the same MLB platform, but the design will be sleeker. With a neon green tape outline reminiscent of the sci-fi series Automan, the Q8's design was teased in near-complete darkness. From the side view, we can see a more rakish roofline and the pronounced fender "hips" front and rear. It all matches the spy shots we posted in March. Audi says the Q8 is a combination of a luxury coupe and a sporty SUV, following the formula first established by the BMW X6. We would expect it to seat five or four with a full back seat center console instead of the Q7's three-row, seven-passenger configuration. Despite being teased ahead of the Beijing show, the Q8 will probably not be fully revealed there. When it hits the market, it should be available with gasoline, hybrid and diesel powertrains depending on the intended market. Earlier rumors included both S and RS performance versions. The top RS Q8 would apparently have a Porsche-sourced 4.0-liter twin turbo V8.